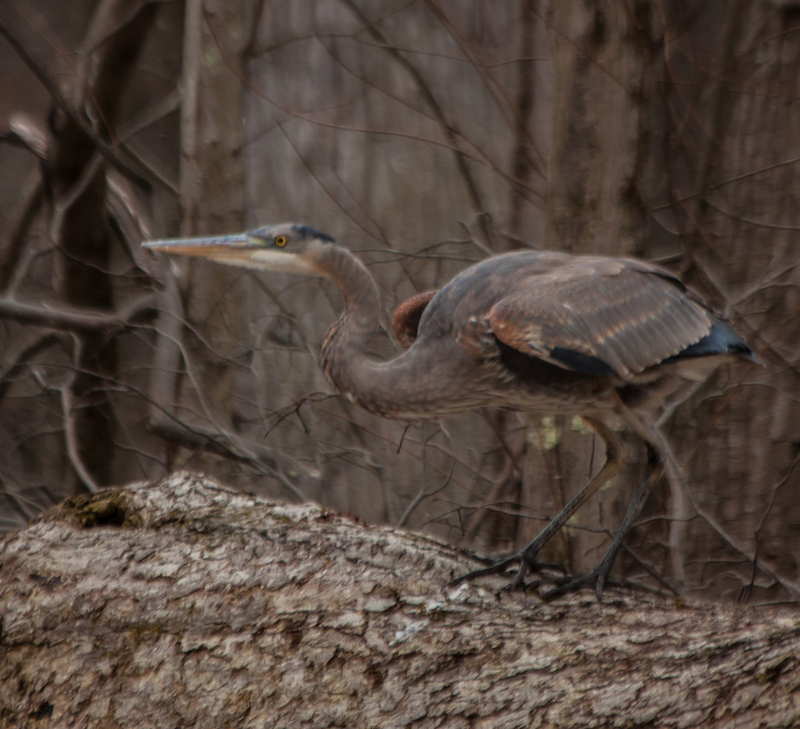 The Great Blue Heron (Ardea herodias) was standing tall on the trunk of a fallen tree last weekend and extended his neck as he looked all around. When he bent down and leaned forward, I knew he was getting ready to take off and I managed to get this shot just before his liftoff. 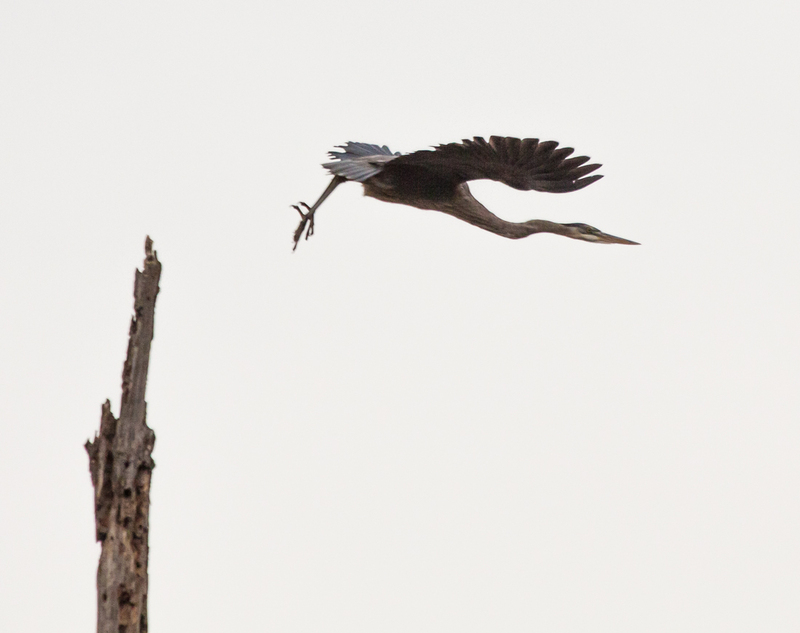 When the Great Blue Heron landed high in a limbless, skinny tree, I suspected he would not be there long—it was like he was perched on top of a flagpole. I managed to capture of series of action shots as he pushed off from the tree and launched himself into a dive. The shot below give you an idea of the height of the tree in which he was perched. It looked to be dead and mostly rotted and was in the center of a marshy field. It was early in the morning and there was heavy cloud cover, which is why the sky looks so white. The photos were mostly silhouetted, but I tried to lighten the shadows a bit to reveal some details. 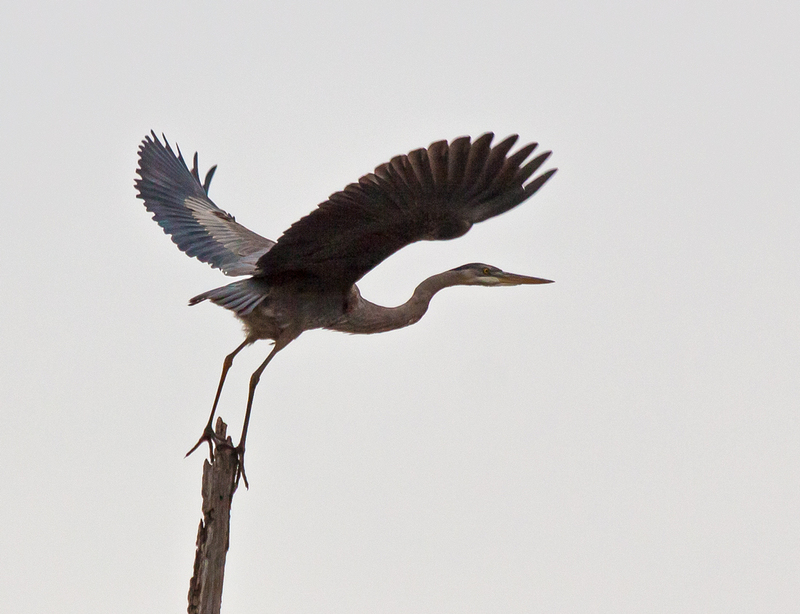 The next shot shows the Great Blue Heron (Ardea herodias) a split second before he took off. He has extended his wings and is leaning forward. Obviously he had received the call from the control tower that he was cleared for takeoff. This final shot suggests that the heron propelled himself forward with his legs before using his wings, ending up in a somewhat unusual position. I was able to track the heron until he disappeared into the trees, which let the buffer in my camera catch up with me—as you might suspect, I was shooting as fast as my camera would fire. 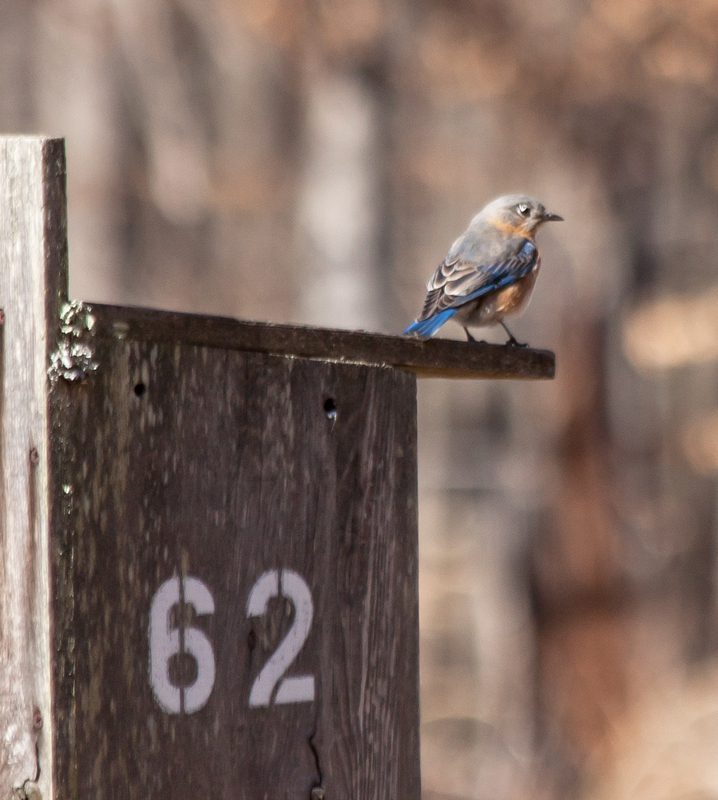 I saw a flash of blue in the distance and I smiled, for I knew it was an Eastern Bluebird (Sialia sialis). Bluebirds have that effect on me. Why? I suppose that I can blame the Wizard of Oz, a movie that I watched repeatedly during my childhood. Who could forget Dorothy singing of happy little bluebirds flying beyond the rainbow? Snow sometimes causes me stress. I worry about the safety of the road conditions and how long it will take for me to get to work. I feel anxious as I shovel out my car and the sidewalk in front of my townhouse. 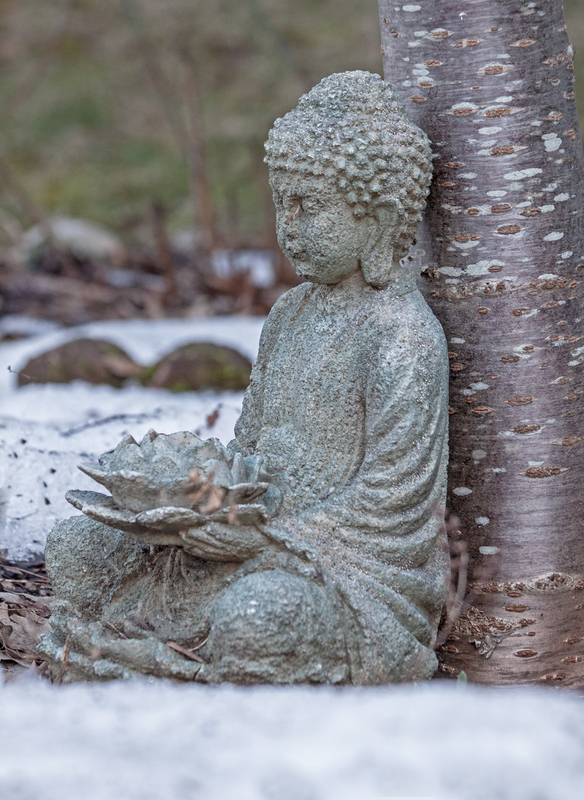 This statue in the garden of one of my neighbors is a visual reminder that I can adopt a different mindset. I can remain calm on the inside and indifferent to the cares of the world. The snow will melt and spring will come when it is time. 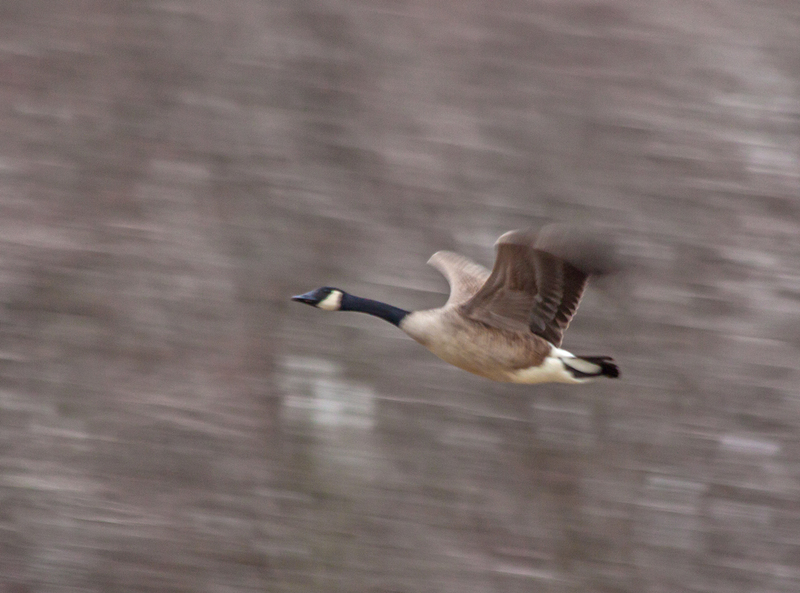 What happens if you try to photograph a bird in flight with a shutter speed of 1/100 second? Under most circumstances, you get a really blurry image. However, if you can track your subject by panning the camera, you can freeze (or in this case, almost freeze) the action and as a bonus you get a really cool background. It was pretty early in the morning and there was not a lot of light when I took this shot. Even though my camera was at ISO 400 and f/6.3 aperture, I knew that the shutter speed was not going to be fast enough to stop the action, given that I was in aperture-priority mode. That’s the main reason that I resorted to trying this panning technique. Getting the right speed for a pan is little hit-or-miss and I never know for sure how well it will work until I look at the results. I’m pretty happy with this result, because I managed to capture a sense of motion in a still shot, a sense that is accentuated by the motion blur of the wings, as well as by the feeling of movement in the background. 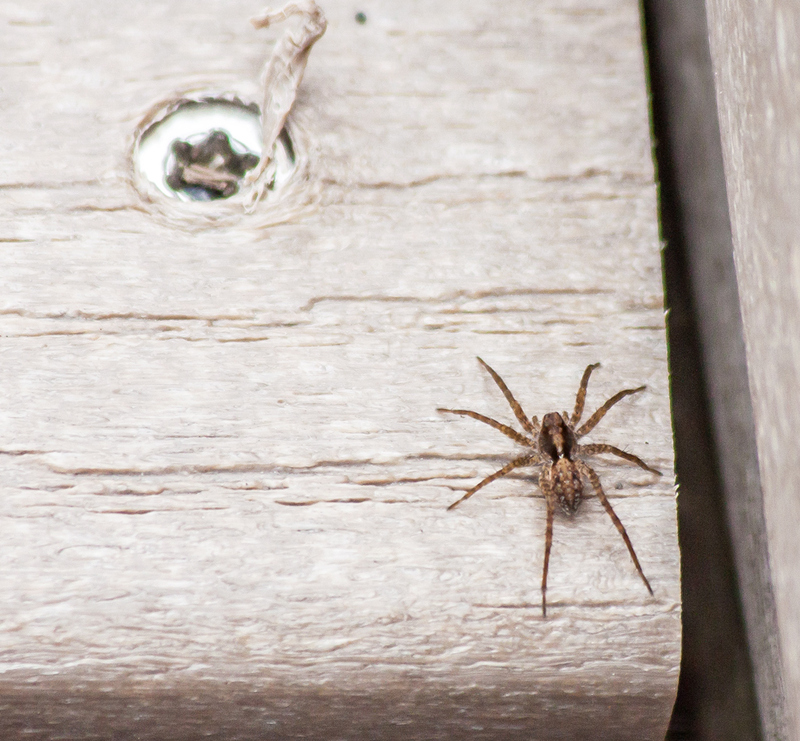 I was a little surprised yesterday when a small spider crossed my path when I was walking on the boardwalk at my local marsh. 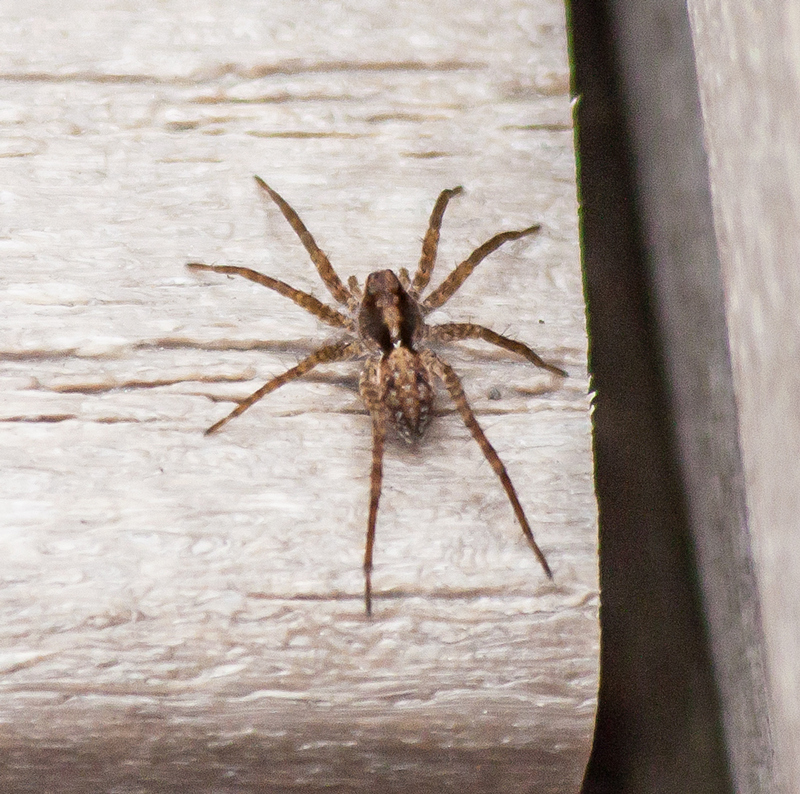 Sure, temperatures had warmed up and it was over 50 degrees outside (10 degrees C), but I didn’t think there were any spiders around at this time of the year. This is definitely my first spider of 2014. Expecting to photograph birds, not bugs (yes, I know a spider technically is an arachnid, not a bug), I had equipped my camera with a telephoto lens, not a macro lens, and wasn’t even carrying my macro lens. The spider was moving too, so I used what I had and shot these photos at 300mm and cropped them. You can probably tell that the boardwalk at the marsh is made of a synthetic material and not real wood, which means that I am not at risk of getting splinters when I kneel on it as I often do. 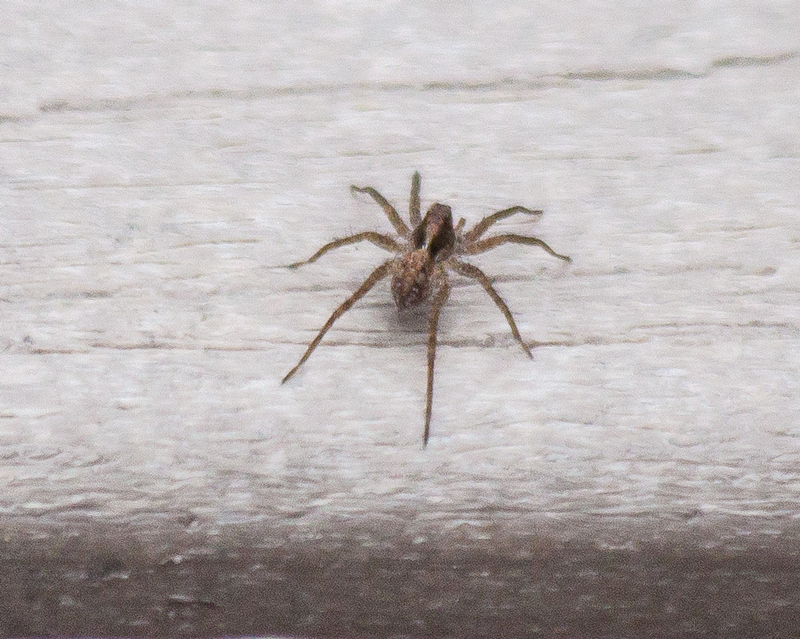 This spider, whose species I cannot identify, was pretty small. The visible head of a screw used to hold in place the planks of boardwalk help to give you an idea of the relative size of the spider. Eagle-eyed readers may notice that the third photo is the same image as the first one, but cropped less severely. In a few short months, I hope to see (and photograph) a whole lot more spiders in even greater detail, but the first one of the year is always special. 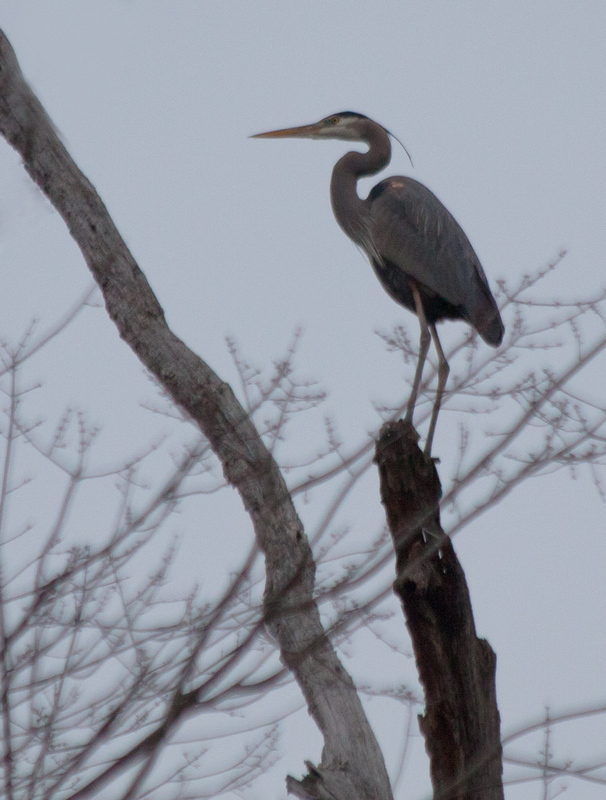 Early yesterday morning, I was so focused on a Great Blue Heron that I spotted high in a tree that I didn’t even notice that there was a Bald Eagle in an adjacent tree until it took off almost right in front of me. Nearby, a female Belted Kingfisher loudly announced her presence with her unmistakable rattling call. The sky was covered with heavy clouds and the forecast called for thunderstorms, which meant that lighting conditions were less than optimal for taking photos in a wooded area. Still, it felt great to be outdoors on the trails after a week of constrained activity thanks to our recent snowstorm. 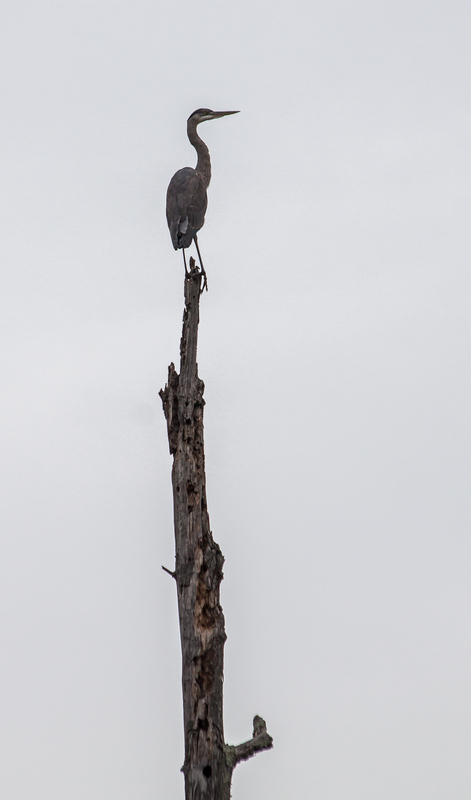 I hadn’t seen a live Great Blue Heron (Ardea herodias) at my local marsh in quite some time, so I was excited when I caught sight of the heron, perched on broken-off tree at the edge of one of the marshy fields. 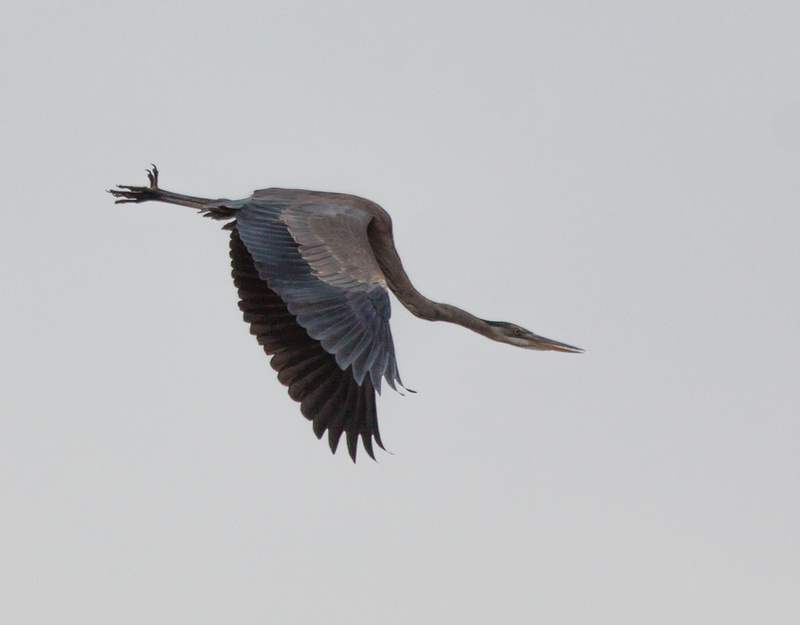 The heron was almost a silhouette against the sky, but its shape is very easy to recognize when you see it in profile. As I was creeping forward to get a clearer shot, I was startled when a large bird flew right across my field of view—I knew almost immediately that it was a Bald Eagle (Haliaeetus leucocephalus), although it too was mostly a shadowy silhouette as I viewed it through the branches of the trees. 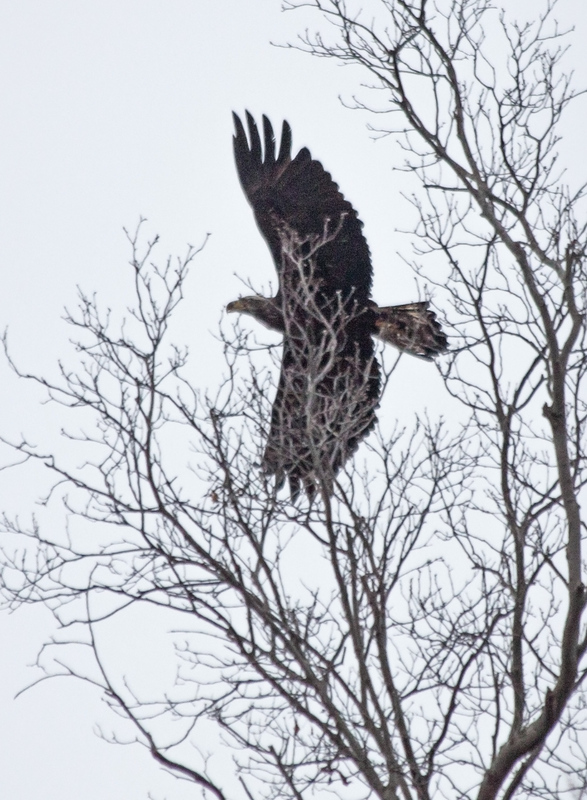 I was able to react quickly enough to get off a few shots before the eagle flew out of sight. 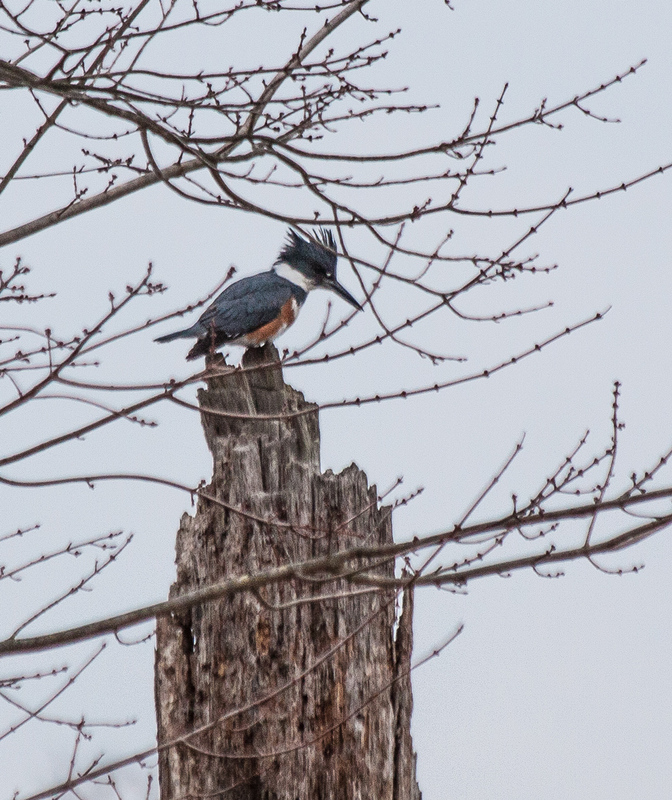 A short distance away, a female Belted Kingfisher (Megaceryle alcyon) was perched on the trunk of a rotted tree, intently staring down at the shallow water of the marsh, looking for prey. That water prevented me from getting closer to her, but I did manage to capture her distinctive pose through the branches. I am an early bird by habit and it was great to be outdoors in the “wilds” of my suburban marsh to see what other early birds I could find.